The overall floor area of Mohill Community College is 5670m² (over 61,000 sq ft). The large building has, in the words of the Architect Michael Hegarty, been designed in the context of the landscape of South Leitrim. The views of distant hills are framed to provide the educational backdrop to the majority of teaching spaces. The school is at one of the highest locations within Mohill and can be seen from many parts of the town. This prominent location provides for spectacular panoramic views from the school Library and other classrooms. The building widens towards the south to fill the circulation spaces with daylight at all times of the day. The school is widest where most student movement occurs and this allows for circulation areas up to 9 meters wide. The building is constructed using robust high quality materials that have a proven track record in educational buildings and the school is fitted out with the most up-to-date educational resources and materials. 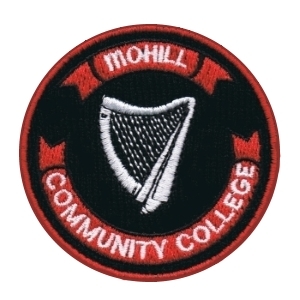 Mohill Community College was in the very fortunate position of having made available to it ten acres of land formerly owned by Mercy Sisters Western Province. This afforded the Architect a large green field site, five acres of which has been utilised in building and present grounds. The remaining five acres have been developed into a football pitch with hopes to be able to play on the pitch September 2017. The College retained the Marian College football pitch which is in close proximity to the school and is used for Games classes. The College grounds, as well as accommodating staff parking and all ancillary services – boiler house, oil and gas tanks, external store and secure yard – also have four Basketball Courts. The buildings and grounds are monitored by the school’s CCTV system (Ref. CCTV Policy). The school has a number of specialist facilities including a large competition size Sports Hall, Special Education suites, Guidance classroom, three Science Laboratories, a large Design and Communications Graphics Room, Wood & Metal Technology suites with shared Wood Machining & Preparation Room, three Information Technology/Multi Media Rooms, Music & Drama, Home Economics, Dress Design, Art and Lecture facilities. In total there are 39 main teaching spaces and most of these have specialist support spaces and resource areas. Three Computer suites, one of which is also equipped as a Language Laboratory, form the core ICT resources in the College. In addition, each teaching space/classroom is equipped with at least one Computer and Data Projector. Six classrooms have an Interactive Whiteboard. One Visualiser is available to the Geography Department and one to the Home Economics Department. The College enjoys high speed Broadband and Wifi. The Computer System is networked. The Administration Offices enjoy optimum ICT resources. Teachers have a Microsoft Tablet and Office 365, with all students provided with a school email address. The College has access to the Astro Turf Pitch sited on the College grounds. Co-funded by FAI, Leitrim County Council and Mohill Town Swimming Pool Committee, the pitch is reserved for school use (St. Manchan’s, Hunt School & Mohill Community College) during school hours. Local groups wishing to use the Pitch may book by phoning MCC Office where a Booking Record is kept. The Mohill Schools have access to the Astro Turf pitch during the school day 9:00am – 4.05 pm. Eivers Lane Pre-School and After-School groups will also be given priority when booking. School groups using the facility in the name of the school must be accompanied by a member(s) of school staff. Unless a member of relevant staff accompanies a group it is not considered a formal school booking. This is each week from March to December. Mohill GAA Club have booked these facilities (Astro Turf Pitch and former Marian College pitch) March to September various days. A group who has not booked the Astro Turf cannot ask another group to move. The school takes no responsibility for students using the Astro Turf Pitch unsupervised by a staff member.